Crossogue Equestrian in beautiful Tipperary, Ireland, welcomes adult guests, families and unaccompanied teenage guests for fully inclusive Ireland riding holidays. 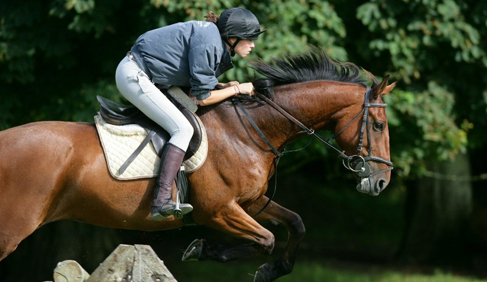 Crossogue Equestrian offers riding vacations and equestrian training opportunities for guests in a number of equestrian disciplines with a specialty in open countryside horse riding and cross country jumping. 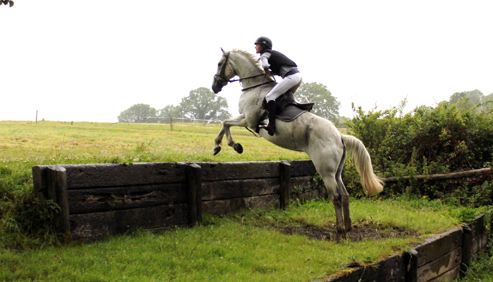 There are gallops and a diverse range of cross country obstacles all over the farm with lots of challenges for both horse and rider. All riders first spend time in the arena with expert instructors, so they can get to know you and you can get to know your horse and develop confidence in the partnership before embarking on the challenges that await on your Ireland equestrian vacation. 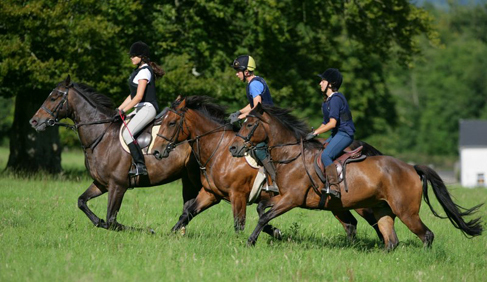 Trails and cross country rides wind through fields of young thoroughbreds and breeding stock. Guests on these Ireland equestrian vacations are invited to share in the experience viewing the young horses as they develop and those in full training. The Molloy family, who own and run Crossoque Equestrian, have been involved with horses for five generations. They also train racehorses for steeplechasing and guests are welcome to watch all aspects of the training routine and come racing when the family has runners. 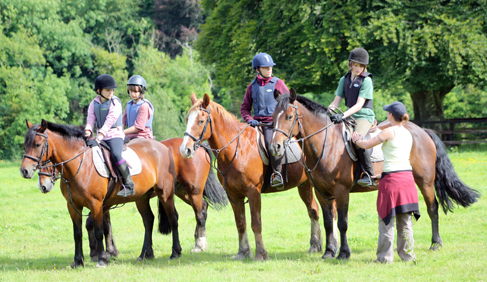 For over 25 years, young riders have been an vital part of Crossogue during the summer holidays. There were six children in the Molloy family and today the summer riding camps are just like what they experienced during summers with friends when they were teenagers. Young guests enjoy the change of scenery and the variety of horse riding activities that they've come to expect at Crossogue. Because this Irish horse farm is centrally located, a day at an Irish hunt can be organized on any day of the week for your Ireland equestrian vacation. Crossogue Equestrian will select the most suitable meets, booking guests in and organizing the best horses to suit each client individually. The staff will provide you with food for the day for your Irish hunt and a little something to revive spirits at the end of a long and exciting day. Crossogue Equestrian is also happy to organize pre hunting clinics for those who have not hunted before and want to be properly prepared of the day's sport. - Your own Itinerary- 7 NIGHTS, 14 RIDES – all-inclusive /extra! We are happy to put together an itinerary for groups to combine horse riding with alternative activities and sight-seeing as part of a personalized package. 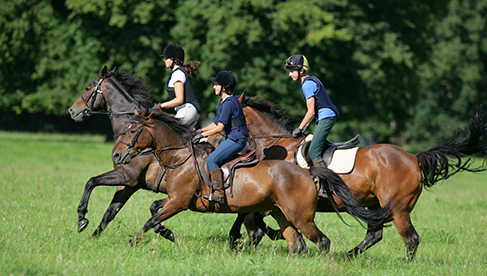 Summer Camps for Teens / Cross Country Horse Riding: fully inclusive, with 2 rides per day (1,5 hour each) and transfer from/to Dublin Airport on Saturdays. More information on dates and rates for these riding vacation packages. Equestrian training, cross country jumping, arena work, Irish hunts, teen summer riding camps, trail riding and hacks, side trips to horse shows like the Dublin Horse Show. 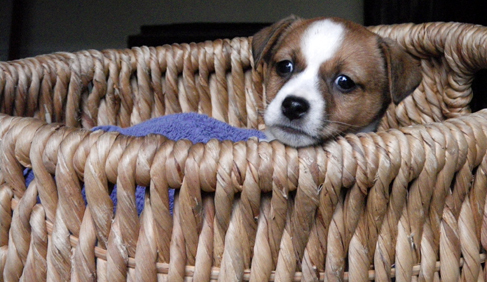 Tennis, badminton, croquet and routes for runs or walks throughout the farm. Nearby golf, swimming, fishing and horse racing. This centrally located farm allows for excursions for shopping and sightseeing throughout Ireland. Crossogue, a Listed Georgian house is constantly alive with the buzz people who enjoy all things equine, guests just become part of it all and it has a feeling of home away from home to many at this stage. There are 8 different rooms ranging from ensuite double rooms to double rooms with a shared bath, to dorm-style shared rooms with shared accommodations. The house also has a living room, dining room, and kitchen – where our meals will be prepared. Just beyond the house are the stables and fields where we can see our horses grazing when we’re not riding. Meals are a focal point of the day at Crossogue when guests get together to talk about the day’s exploits. Good home cooked meals using local and fresh produce, including from our vegetable garden when possible, are a big part of the Crossogue experience. We cater for all dietary needs, just let us know when you are booking. 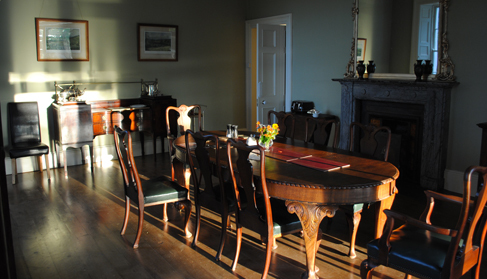 Central location in the heart of Ireland allows guests to visit numerous attractions. During the day when guests are not riding, we have a number of alternative activities at Crossogue including tennis, badminton, table tennis, games, walks on the farm as well as organised team activities and fun competitions. We also show films in the evening. Crossoque Equestrian are happy to build in sightseeing to Ireland vacation packages and assist guests in the planning of their sightseeing days, including a special trip to the Dublin Horse Show as part of your Irish riding holiday. 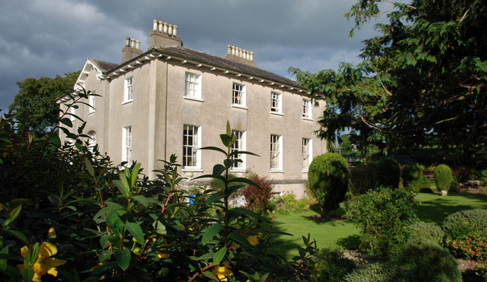 At Crossogue House we specialize in entertaining individuals and small groups/families from the beginning of April to mid-June and then from mid-August through to the end of November. 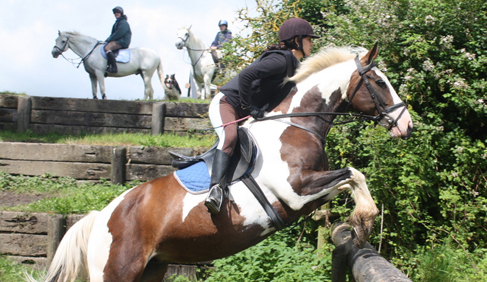 We can cater for all standards of rider due to our range of both excellent horses and facilities. We take time to know each rider individually and provide the ideal horse to meet their needs and our guests find the personal nature of our instruction gives both confidence and the opportunity to reach personal goals. While we offer tuition in a number of disciplines, our specialty is riding in open countryside and we offer riders of all standards the opportunity to enjoy riding throughout Crossogue farm. This can be a gentle ride for those who want to relax and simply enjoy being on horseback and being part of the nature that surrounds them. 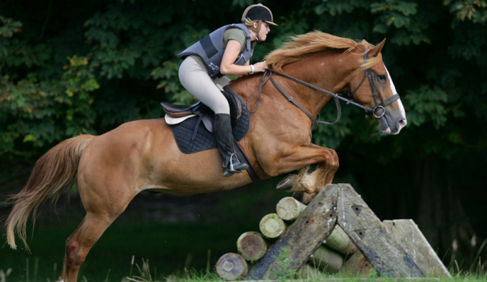 For the more adventurous there are gallops and a diverse range of cross country obstacles all over the farm with lots of challenges for both horse and rider. With all our riders, we first spend time in the arena, so we can get to know you and you can get to know your horse and develop confidence in the partnership before embarking on the challenges that await. 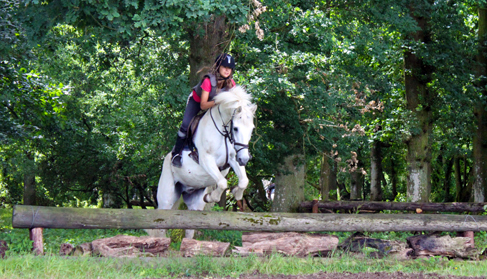 With our expert instructors and well trained horses in cross-country jumping you will quickly develop the confidence to tackle our large selection of well-made obstacles for all standards of rider. Our spring season will run from the 7th of April to the 10th of June and our Autumn Season will run from the 26th of August to the 18th of November. 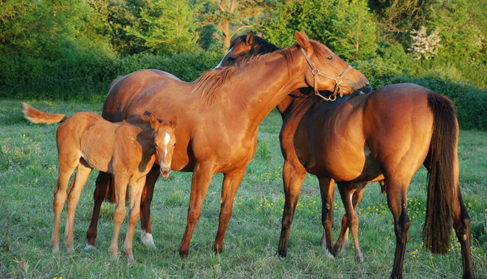 Equestrian vacations in Ireland on a working Irish Stud farm in Tipperary, with excellent cross country jumping for all levels of rider in a warm, relaxed and friendly atmosphere. For international guests $1,323 USD* (€1,250) per week fully inclusive including transfers from/to Dublin Airport on Saturdays. Check out more information and learn about Crossogue's Adult Riding Holidays. * price is based in the Euro, so USD price is subject to changes based on currency conversions.